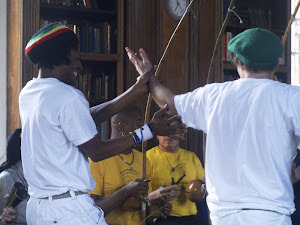 Capoeira Angola - South London: Classes start this Wednesday in Stockwell - Fran will lead classes. Classes start this Wednesday in Stockwell - Fran will lead classes. Classes in Stockwell will start on Wednesday the 9th. Fran will be leading the classes this week! Fran is an experienced student that has trained with Mestre Jose Carlos in Rio de Janeiro. Hope to see you all on Wednesday.